"That's it?" you're thinking. Yup, that's it. Nice and easy. Because a couple can get married at the Four Seasons in Georgetown or a farm in Charlottesville, but if the only pictures you're shooting fit into some formulaic grocery list downloaded off of weddingphotography101.com, how can you tell the difference? If every photograph from the day involves permutations of family pictures in the rose garden, how do you know what the weekend was really about? Meggan Crum and Scott Schneider were clearly thinking not last week's wedding when they chose a secluded, fog-encased beach in Tofino, British Columbia as the site of their nuptials. This place is so off the beaten path that it took almost seven hours to get there by car and ferry. And that's just from downtown Vancouver! 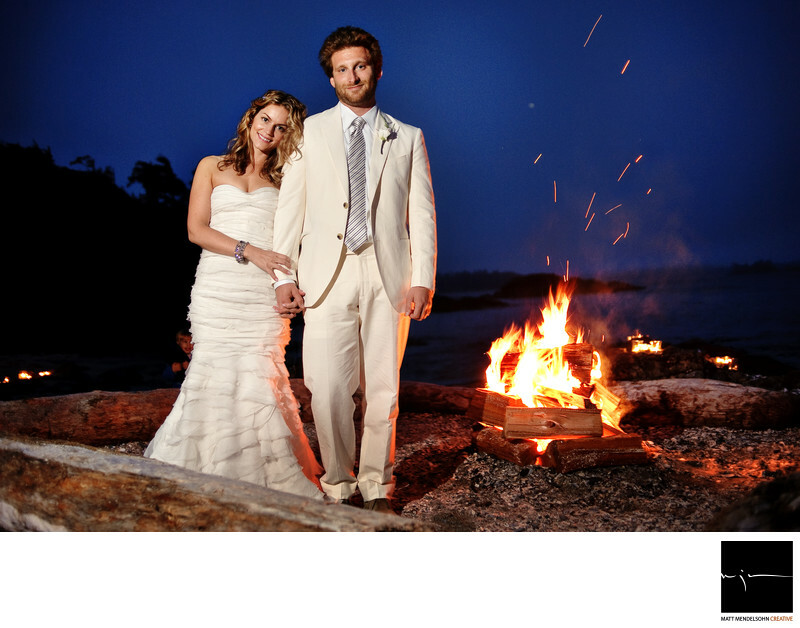 Scott and Meggan fell in love with Tofino when they first visited there, and they knew that it was the place for them. It's easy to see why. More than simply asking friends and family to go to an out-of-the-way destination spot--Costa Rica, say--these guys wanted their loved ones to experience a place that actually has meaning to them, that actually represents who they are. And how long did it take me to figure out that Tofino, this little, hippy surfing village on the Pacific Ocean represents who Meggan and Scott are? About ten seconds. I had just arrived from my journey to Tofino and met them at their cottage at the Long Beach Lodge Resort. They were on their way over to the Wickaninnish Inn, a Relais & Chateaux property where the wedding would take place, and I asked if I could jump in back and scope things out. We walked onto the beach and that was it. Meggan, who, back in New York, is the accessories editor for In Style magazine, looked immediately at home and, well, non-New York-ish in her big, comfy sweater and no shoes. It's the anti-New York, this place--quiet, undeveloped, pristine. Scott, meanwhile, was having a blast pretending the 8 ft. strands of seaweed that litter the beach were bullwhips left behind by Indiana Jones. I got it immediately. Tofino is a place without pretense. You can be Indiana Jones if you want, or you can be a kid listening for the ocean in a shell. This is not the Hamptons, where one goes to be seen, but rather a place one goes to be ignored. It's a place where the best fish tacos you'll ever eat come from the side of an old truck, where you can watch a mother bear and her cubs prowl the beach looking for crab, and where the salmon you're eating tastes so amazingly good simply because it was swimming in the ocean an hour earlier. "Simply" might be the best word of all here. Tofino is a wonderfully simple place.